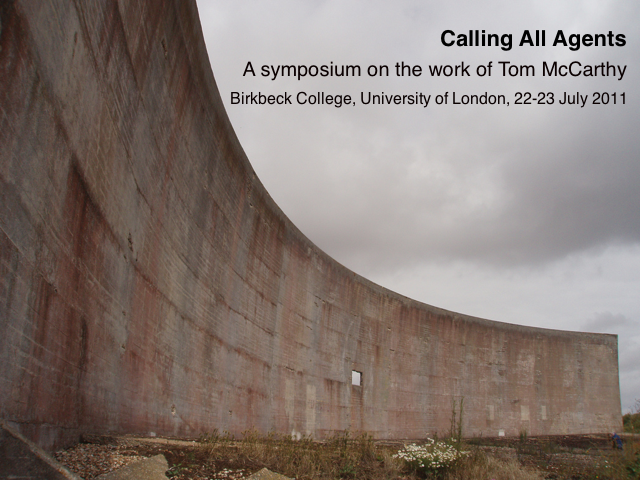 Earlier in the summer I gave a paper at “the first international symposium on the work of Tom McCarthy” responding to Tom’s LRB essay ‘Stabbing the Olive’, in which he argued for a geometric fiction. The video of the paper is here. I’d written about Tom’s work during my MA and we’d done a brief interview by email about Remainder which is published below. An overview of the entire event written by attendee Martin Eve is here, while Derek Attridge wrote a brief review in the Guardian Review the next weekend (‘McCarthy has leapfrogged many older novelists into the academic canon.’ (Derek Attridge, ‘THE WEEK IN BOOKS: Booker odds, Tom McCarthy in conference, Muriel Spark at the Poetry Society’, Guardian, Review Section, 30 July 2011, p. 4). As a not-yet-doctored speaker, it was exciting to give a paper to an audience that included the author, assorted INS cohorts – including Simon Critchley, who also spoke – and Eng Lit profs like the aforementioned Attridge and Andrew Gibson, whose paper on Speculative Realism opened up a lot of interesting channels. The afternoon session was pretty lively as the more established folk exchanged opinions in robust fashion. Kudos to Burkbeck’s Dennis Duncan for organising. A collection of essays around the symposium is planned by Glyphi Press, so I’m not going to post the text of the paper because I’m working it up into an essay that I’ll submit for that. Tom has been active over the summer: the blog Surplus Matter maintained by 3AM magazine’s Andrew Gallix keeps tabs on McCarthy material online so I refer any interested parties to that for some great articles and talks. I wrote the essay on Dickinson’s work a year or so after finishing Remainder, so the more formal thinking-through of the question of re-enactment that you get in the essay hadn’t happened for me when the novel was taking shape. I hadn’t read Levinas at that point, for example. But writing about Dickinson’s work was a kind of formalising after the fact of some of the questions raised in Remainder. The protagonist of Remainder is much less of an ethical subject than my putative model viewer of Dickinson’s re-enactment, though. 1) As his programme of reconstructions progresses, he loses his subjectivity for periods to increasingly frequent fugue states. Are his re-enactments in fact creating problems for his subjectivity? His re-enactments both give him the possibility of subjectivity and remove this, pull the rug from under his feet. It’s a catch-22 situation. Perhaps you could draw a parallel with some of Lacan’s notions of how, for example, the imago both forms a vital component of the thrust towards subjectivity and, by always remaining just outside the circle of the subject, that elusive extra part, makes a totalised or unified subjectivity impossible. Ditto the little other or objet petit-a. I wouldn’t want to paint the correspondence between Lacan, or any other thinker, and Remainder as that schematic, but the echoes are there. 2) As he re-enacts increasingly ‘found’ events he enters an ethical space but responds in a neutral manner. Indeed any sense of an ethical subjectivity is absent from the narrative. Has he failed to relearn an ethical framework? The obvious answer would be that yes, he fails, he ends up a psychopath for whom the deaths he causes can only be understood in terms of their aesthetics, as ‘beautiful’. But in fact I think he does engage with ethics, in a totally Levinasian way, when he does the shooting re-enactment. In that sequence, he opens himself, his time and consciousness, up to the absolute otherness of the man whose death he’s re-enacting – its mute enormity, its endlessness and so on. The authorities have cleared the area, washed the blood off the street and erased all traces of the event, but he goes back to it, and lets it snag him, tear him open, again and again and again. He, not the sane people around him, is the one who keeps repeating the mantra ‘Everything must leave some kind of mark.’ Levinas characterises the ethical moment as an entry to a diachronic space in which traces of surprised forgettings are recovered: that’s the space my hero wills – cudgels – into being and occupies, repeatedly. The term ‘event-field’ is not a term I’m familiar with, although your citations from Faulkner make it clear how an event field operates: as ripples spreading out from an original event. Could you elaborate on this idea? I think Faulkner said it all. You get ripples, and more ripples, moving over pools that aren’t even necessarily the one in which the original stone dropped. Events play out over generations: the playing out is itself the happening of the event, although the event itself always remains outside of its own field, even if it passed through its plane at some unspecified point in the past, ruptured it. Badiou’s thought might hold some answers here. But in that magnificent passage (from Absalom! Absalom!) Faulkner also talks of seeing, remembering and reflecting, which for me echo (again) Levinas’s notions of bearing witness – although for Faulkner the rippled pools aren’t bearing witness to the event as such (the stone dropping) but rather reflecting ‘the infinite unchanging sky’ from which it fell. Cracks, rips and imperfections are recurrent in Remainder. In these irruptions reality returns – Lacanian tuches or Barthesian puncta – and you exploit the possibility of lending such seemingly insignificant events an ever-expanding event field. Does an event-field view of history prioritise the traumatic event? Are these in effect micro-traumatisms? Yes and yes. An event-field view of history is impossible without a traumatic event at its core. And then the little rips you mention are like stand-ins for the big one, little envoys, mini-mes. They’re like the boy whom Godot sends to keep Vladimir and Estragon in a state of anticipation. The big one will never appear and show itself, and yet we live in the belief that it might – live for that belief even. The second half of chapter three, an imagined conversation with a homeless man in a restaurant, appears to effect a narrative equivalent to such a notion: the artifice of narrative is punctured in this moment. How do concerns change when writing a fictional narrative about the re-enactment of found events as opposed to writing critically about art events that are themselves re-enactments? Fiction is intuitive. I was in a bathroom at a party, not entirely sober, looking at a crack on the wall, got a moment of déja-vu, and in half an hour the novel was there. I didn’t stop to work out what it all meant, and in fact still haven’t. It just made sense, in its own warped way. With critical writing, it’s more about making sense of that kind of intuition in retrospect. That’s not to say that critical writing can’t be creative and exhilarating – look at the work of Derrida, for example – but it does inhabit a different mode. Because the trauma suffered by your protagonist is a physical as opposed to purely psychical trauma, it remains unclear whether or not his amnesia is a result of brain tissue damage or a psychological condition. How important is this ambiguity between the physical and the psychical trauma? Not that important, frankly. There’s no Cartesian split in Remainder. The hero is ill-at-ease in the world physically and behaviourally and mentally, but these are all part of the same complex. It’s a very materialist book – in effect, what he’s coming to terms with throughout it is a certain materialism, a matter-based vision of existence as opposed to a transcendent one. His mind is matter, damaged brain tissue, and the world is matter, bitty flows and scar tissue all bathed in liquid daylight spilling from a ruptured sun. Some key terms in both Remainder and the field of trauma studies operate doubly. Chief among these is notion of authenticity which is implicated in debates over witnessing – indeed the crisis of witnessing uncovered by Abraham and Torok in Cryptonomy is fascinating in this regard, placing it at a crux point in the history of psychoanalysis as well as at the history of modern trauma theory. In your work authenticity is at the heart of a crisis in subjectivity. Do you aim to exploit this doubling? I’m not sure what you mean by ‘doubling’. Paul de Man has written a brilliant essay about doubling, a term he takes from Baudelaire’s notion of dédoublement. For Baudelaire, and subsequently de Man, doubling names the effect of self-consciousness that prevents us from being authentic: if we can reflect on our experience, that means we’re not simply living it, and we’re therefore split in two and consequently not complete. What’s worse, figuring all this out doesn’t bring about a return to authenticity, but rather re-doubles the problem, makes it play out at more and more self-conscious levels, endlessly regressive. Again, I hadn’t read that essay (‘The Rhetoric of Temporality’) when I wrote Remainder – but it could be describing the book. In fact, it’s the best thing ever written about Remainder, without even mentioning it! Not only is the modern understanding of the term trauma a medico-legal construction, but so too has the reconstruction become a medico-legal tool. The artistic re-enactment operates in this context but how does the medico-legal aspect of the reconstruction relate to its artistic cousin? One of the first things my hero’s lawyer explains to him about the terms of the Settlement the parties (‘bodies’) responsible for his accident are offering him is that, if he accepts, the accident ‘will cease to become actionable’. In the first draft, I added: ‘It will lose its status qua event’ – but I removed that because it’s bad writing (a lawyer would never say such a thing, unless he was a philosopher as well). But the legal moment of erasure of the ur-event, of ur-erasure (say that fast if you can), goes hand in hand with the more philosophical (Blanchodian) erasure. And the medical one. I did my research: even the most positivist psychologists, the kind of people who would oppose Freud on every other point, concur with him completely that the trauma-moment bypasses the narrative chain we call memory. Their term for this phenomenon is ‘dissociation’: the data gets laid down in the brain (in the hipocampus, to be precise), but not as memory. So it’s there, but in an absent or negative form – but no less there for that. I’d say the artistic is the synthesis of all these modes, plus a little more besides – but I wouldn’t want to say what that little more is. It’s the remainder maybe. The hero of my novel doesn’t at any point consider himself an artist, though – although that’s a slight sleight of hand because the novel itself belongs to the category of art, and to a large extent allegorises it. But if he’d stood in front of the crack when he experiences his moment of déja-vu going ‘Oh yes, this is a bit like Proust and the madeleine,’ the book would have been over then and there. Ars est celere artem, like the man says.